There’s no denying the fact that leading a nomadic lifestyle comes with a high potential for chaos. You’re constantly on the road, waking up in new places, and lugging around all of your belongings in the smallest suitcase or backpack you can manage. It’s understandable to feel a bit overwhelmed just thinking about it. But people do it, and do it well, so there must be a secret, right? Not quite. It’s as simple as establishing a daily routine. Yes, it sounds boring, and if you’re like me it’s quite difficult to put yourself inside any boundaries. But it doesn’t have to be as boring (or as hard) as it sounds. You’ve probably heard about Twitter and Square CEO Jack Dorsey’s celebrated morning routine. He’s up at 5am every day for meditation, exercise, and coffee - in that order. He’s in the office at Twitter by 9am, then at Square after lunch. He’s networking or doing more work in the evenings and in bed by 11pm. Every. Single. Day. It sounds intense, but Jack’s credited his focus and sharp mind through the years to this routine, most concretely to meditation and exercise. Jack’s advantage is that he’s only going between 3 locations, his home and his two offices. So how does one effectively get into a routine on the road? The first step is to define something I call “me time”. This is something that you inject into each day that serves as the anchor - it grounds you, and from there you can plan your entire day around it. It should be the governing construct for your day, and thus for your routine. For me, it’s exercise. As soon as I get to a new place I make sure to join the local gym. Here in Porto, I’ve decided it makes most sense for me to work out in the mornings, so I pick classes at the gym that work with that schedule. If the classes don’t work, I’ll do yoga or go for a run. While I’m working out, I’ll think about my goals for the day and start to put some basic structure around those. I noticed a similar trend when I spoke with a few nomadic developers I’ve met here in Porto. Ken, a developer from Philadelphia, has been working on the road for the last year. Before that he spent time living in Melbourne and Edinburgh, and he doesn’t have any plans to stop traveling at the moment. His trick is to set an alarm each night for 10:00 the next morning, including a note that explains what his goal is for the day. Sometimes the goals are work related, like completing a new feature. But he also sets personal goals, like posting a new drawing each week. From there, he has a general construct for his day that he likes to follow. The reminder is important because it helps him stay focused. Ellen, a data engineer from Berlin, has a similar strategy. She structures her day around a block of time she sets aside each morning to self-organize. Combined with a general framework for what the day should look like, the time in the morning allows her to apply her goals and to-dos to produce a plan for the day. She also makes sure to separate her workplace from her home or places she goes to have fun, which allows her to be productive during the hours she designates as work time. Johan, tech lead and co-founder of a startup based in Amsterdam, thinks about it a bit differently. He likes to separate the routine he keeps at his home base from the one he has while on the road, since he doesn’t travel for extended periods of time. But, there are similarities between his routine at home and on the road. He has to start the day with a good breakfast, and then a standup meeting with his team. Starting the day right and maintaining a connection with his colleagues ground him. As you can see, the “me time” construct isn’t unique. It shows up in the routines of many. Take Marcus Meurer, an established digital nomad based in Berlin and founder of the DNX conference. He describes his daily routine as “scripted”: breakfast, journaling for 5 minutes, meditation, and exercise. After that he starts working on his “MIT”, or most important task of the day, which he has defined the night before. Marcus credits his success and happiness to that 5 minutes of journaling and the strict focus on accomplishing one task each day. In addition to setting aside time for yourself and outlining your goals for the day, there are other parts of the daily routine that help establish order in a traveler’s life. Establish a space for working. This could be a co-working space, a cafe, or even a desk in your room. But creating that real space actually helps create the mental space you need to focus on work when it’s time to start the day and be productive. Try to wake up at the same time each day. I set my alarm for 8am each day and try to have a workout planned for shortly thereafter. Even if I don’t always wake up at 8, having that plan each day keeps me sane. Identify your “go-to” spots early on. After I choose my gym and my office/co-working space, I’ll spend a bit of time on Yelp or Google to see where the best grocery stores, cafes, banks, etc. are located nearby. With a bit of trial and error you can usually identify reliable spots on your way to and from your daily routine spots. Know when to curb your wanderlust. Being on the road is fun, and the chance to explore is likely one of the reasons why you’ve chosen this lifestyle. That being said, I recommend setting aside at least 2-3 nights each week to stay in and not meet friends for drinks or go on a city walk. If you want your time on the road to feel like “normal life”, you’ve got to treat it that way. Sometimes, these nights are my favorite - the opportunity to stay in and have a date with myself! Make your bed every day. This daily accomplishment is surprisingly satisfying. When you make this a part of your routine it also helps you feel a little more at home. Get involved in the local scene. Signing up for a weekly dance class, workshop, or meetup group is a great way to not only add more stability to your routine, but also meet people. Do you think routines are important? What does your “me time” look like? I’d love to hear about it! I was recently interviewed by Women Digital Nomads on my experience working and traveling with Hacker Paradise. Check out the post on their site! 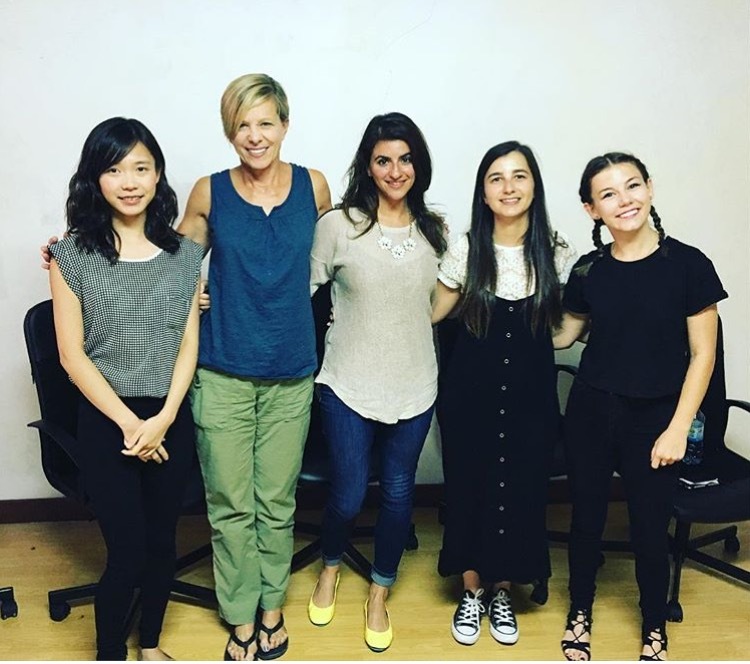 Recently, I had the opportunity to take part in a panel discussion about women in technology. The panel took place as part of Hacker Paradise, a program for digital nomads in which I’m currently participating. The talk was difficult. Even as someone who is a relatively confident speaker, I found my voice shaking as I spoke in front of the audience of mostly male developers & entrepreneurs. A great deal of the subject matter was highly personal and reflected my own experiences, or the experiences of the other women on the panel. And I wasn’t sure how the suggestions we put forth would be received. When I volunteered to give a talk on this subject, I thought to myself, “there’s no way a bunch of developer dudes are going to want to hear about this”. I was wrong! They did, and once a date was picked for the talk, we starting scrambling to put together some content we thought would resonate with our audience. We decided to bring in some of the other Hacker Paradise ladies and make it a panel discussion, focused on best practices for making the tech world a more comfortable place for women. Inspiring women. Left to right: Wendy Hu, Lori Tillery, yours truly, Barbara Mendes, and Cayla Green. Isolation & lack of support. It’s not uncommon to be the only female in the room. Finding allies is super important. Gender discrimination. Includes stereotyping — “You can work on the UI, since you should be good at making things look pretty”. Also includes things like constantly being talked over in meetings and then being told you “need to find your voice”. Sexual harassment. It’s gotten better over the years, but it’s still very much an issue. ‘Nuff said. The pay gap. As of 2014, women are still paid 79% of what men are paid. Each panelist was able to share at least one experience with pay inequality. Imposter Syndrome. Feeling like you’re not good enough or smart enough to be in the position you’re in. Women undersell themselves all the time. I can pinpoint the exact moment my imposter syndrome kicked in. Junior year of college, I received a technology scholarship offered to one student in my program each year. A male student raised his hand in a class and stated that he didn’t understand why I had received the scholarship. This was a couple weeks after I had helped him out by recommending him for a job at the computing center I was working at. Ever since he questioned me, I questioned myself. Nothing new, right? I’m sure some of you are trying to recall situations in which you may have contributed to one of the above issues. It’s OK — that’s a good thing. The first step is recognizing the behavior. Now for the more interesting stuff. How can we, together, help better this situation? It’s not just about the guys. Women, also take note. The key here is to open the lines of communication early, and keep them open. Though I would have loved to have more women mentors throughout my career if they had been available, most of my mentors have been men. I was only able to form a solid relationship with them after I felt like they were open to it. In other words, they made the first move. See a new person on your team? Introduce yourself. Let her know you’re available if she needs help getting up to speed or learning about the culture of the company. But also, don’t assume she’s constantly in need of help. If you make yourself available as a resource, she’ll feel comfortable enough to reach out to you on her own time. You should expect the same from her. Correct bad behavior when you see it. I mentioned the fact that men try to talk over women all the time. After a while, you start to feel invisible. But, there have been some instances that I’ve seen (and it’s happened to me too) when men have actually interjected and said things like “She was talking. Let her finish please.” There’s always a split second of “OMGICANTBELIEVEHEJUSTSAIDTHAT” from all parties in the room. But the invisible woman is secretly jumping for joy inside, because somebody finally noticed. After 11 years of this I’ve become much more aggressive and don’t really stand for it myself anymore. But it takes time to get to that point. If you see things like this happening, speak up. Most of the time people don’t mean any harm, and would rather be corrected. Speaking openly about these issues and attending group events will help you become confident enough to understand who you are, and what you deserve. Know that you’re within your rights to speak up, present a differing viewpoint, and NEGOTIATE for fair pay. This applies to both men and women! Make it known from the beginning that you’re not going to put up with bad behavior. If somebody makes a comment that makes you feel uncomfortable, don’t smile and let it go. Let the person know. You can also reach out to people and ask them for help with sticky situations. This also goes back to the whole speaking up in meetings thing — don’t let anyone make you feel like your opinion isn’t important. Being competitive is human nature and unfortunately, some companies are more political than others. I don’t subscribe to workplace politics if I can help it. But especially in matters between women: I’m a firm believer in the fact that regardless of the situation, women should go out of their way to help other women. I see too much of the opposite. Whether you’ve been in the industry for a while, or you’re brand new, check in with other women to see how they’re doing. Recognize that they’re likely going through the same things you are. Talk about it. Act right. Bottom line, if you’re belittling other women to get ahead, you lose my respect. At that point you’re not so different from the guy who decides to campaign against a woman at the office who won’t sleep with him (yes, this happens). And you might find that helping others actually helps your cause, too. Make it a point when hiring (or looking for a job). If you’re looking to recruit more women, simply open the diversity dialogue. Make it a point to have women on the list of interviewers. Let applicants know that you’ve got X number of women on the team, and X in leadership roles. That your promotion rate for women is X%. That you believe in equal and fair pay for all. Hopefully, you work at a company where you can actually say these things. If you don’t, maybe it’s a good time to start asking questions. You should be asking these questions during any interview process if they’re not already answered for you. In tech, having a strong HR team that cares about these issues is extremely important. If you don’t have this support, and you find yourself in a sticky situation, nobody’s going to care or help you. The issue is big enough now that many support groups have popped up. Whether you’re a guy or a girl, attend events these groups put on. Show your support for the cause. Women have gone out of their way for a while to better understand men’s lives, try it on the other side! Our panel was set up such that we all sat, left to right, ordered by years of experience in tech (30+ years to 5 years). Each panelist had a wide array of stories to share. One of the most interesting questions we received was, how many women do you think we need sitting to the right until the problems go away? Meaning, how many more generations of women in tech will have to work just a little bit harder than their male peers? After a bit of debate about the role of the media (and how traditional portrayals of women need to continue to be challenged), we settled on 2 as a realistic and hopeful number. Let’s keep the conversation open so that we can actually make that happen. And so that we don’t have to talk about it anymore. I want to thank the inspiring women who participated in the panel and the content generation with me: Lori Tillery, Barbara Mendes, Cayla Green, and Wendy Hu. I’d also like to thank HP facilitator Ken Hu for his support. Last but not least, thanks to the fantastic San Francisco Women in Tech organization, whose panel on mentorship in May 2016 inspired the talk! One can make any place home relatively easily. It’s been 4 weeks “on the road” for me, away from my base of San Francisco. The comforts of home are still mostly available. I’ve got my local corner store nearby. I’ve done my laundry on time without fail, approximately once each week. I wasted no time joining the local gym. I’ve got access to great wifi. I work on my day job, my side projects, and I write. I find time for newfound friends as well as time alone for reading and resting. Basically, I’ve settled into a routine of sorts. I’ve been doing this for a while — first as a consultant traveling throughout the US, and most recently for a job that has me overseas once every six weeks. Have laptop. Will travel. Must adapt. I’m currently in the middle of a stint with Hacker Paradise in Portugal. This trip is different because instead of traveling alone, or with a group of people similarly waiting to go back somewhere, I’m with people who may never go back. They are “digital nomads”. Some of them move every few weeks, some stay a couple months in one place, but the goal is always to move and to learn. Some of them do keep a home base, many with parents. But they’re all working, and they’re all productive. This isn’t just a vacation… is it? The term “digital nomad” irked me at first. When I was working remotely, I’d travel in small packs with others of my kind. Sure, most of us had a home and (some semblance of) a plan. How are these people I’m with today any different? It’s hard to track down the origin of digital nomadism, especially because it seems the lifestyle has existed in different forms for quite some time. Throughout history, writers & artists have traditionally been “location independent” (another term coined to describe a person who works remotely, supposedly by Lea Woodward in 2007). But with the dawn of the internet & wireless-enabled laptops in the late 90s, location independence started to become a real thing. In 1997, Tsugio Makimono and David Manners published a book they called, simply put, Digital Nomad. They argued that technology would change the way a large portion of our population works in the future, in that as more and more people take up technology jobs, collaboration tools would become more advanced and the internet would continue to rule. The traditional 9–5 office job would slowly decline over time. The notion soon turned into a movement. The social and sharing economy cemented itself as a fixture in our world, thanks to the likes of Facebook, Instagram and Snapchat. Travel blogs exploded: young 20-somethings hell bent on exploring the world, sharing their experiences with anyone who would listen, hoping to inspire others to do the same. Finding oneself became the name of the game. Recently, social networks dedicated to people who want to stay on the road have started to pop up. One of the most well known is Nomad List, a service that provides a guide to the best cities for digital nomads, ranked by factors like cost of living, fun, and safety. You can also pay a fee to join a slack group, #nomads, which gives you unlimited access to anyone who considers themselves a part of the “digital nomad” community. It seems like this is the true governing body for the nomads. It’s easy to be cynical and immediately dismiss today’s nomadic way of living as a thing for trust fund babies who want to gallivant around the world. Sure, there will always be people who do the nomad thing as means to a getaway. But the lifestyle is in some ways more a product of the fact that now, as Makimono and Manners predicted in ’97, most tech workers don’t need to be in an office. And further, it’s an issue of supply and demand for these workers. When I was a consultant, it was easier and cheaper for a company to pay for someone with my skill set to fly to them each week, rather than spending the time and money to find someone local to bring on as a salaried employee (which has a very high onboarding cost associated with it). So if you’re a remote worker with these skills, with remote clients… you can live where you want and travel as you please. When I think back to my days on the road, I would have loved to have something like #nomads to fall back on. I remember when I lived in Dallas for a long-term project, my daily routine consisted of driving my jeep to Starbucks, working, going to the gym, and stopping at Whole Foods on the way back for dinner. Maybe going with coworkers for dinner and drinks (mmm… tex-mex) once or twice a week. But really, I wanted to meet people local to the area. I didn’t know how to do that. I felt like an outsider. So I stayed inside. Community has always been a theme in nomad packs throughout history, so why should digital nomadism stray from that? Now, the lifestyle has been given a name and formalized. Support groups dedicated to the nomadism can start to flourish. That’s pretty cool. I support the digital nomad “movement”. However, I’ve realized — and it took me years of being on and off the road, plus time with Hacker Paradise to get here — is that I don’t aspire to be a digital nomad. Maybe I did at one point. There are so many amazing things about living this way. You meet intelligent and inspiring people who have seen more, or aspire to see more, than most of the people in your home network. You go on adventures with these people in exciting parts of the world. And you get to know yourself, for better or for worse. You journey solo, you assimilate to a new culture alone, you react to situations that are less than ideal on your own. You learn more about what makes you tick, what makes you happy, and what you need to truly feel at home, even if it’s exactly what you left behind. That might be the biggest surprise of all, and perhaps what nomadism is truly about. A happy nomad, during the São João in Porto. Exactly one week ago, I arrived in Porto, Portugal to start a ten week stint with Hacker Paradise. I came to Porto from San Francisco, one of the most compelling cities in the world. It's the beating heart of innovation in tech, the mecca for adventure seekers, and now the city with the highest rent prices in the US. It's also now my home. I can't imagine another place I'd like to call home right now. At the same time, SF has changed over the last five years. Opportunities still abound, but challenges seem more familiar. The economic climate is changing. Companies are hiring too fast and as a result, having to lay people off. Startups aren't getting funding as easily as they used to. We are due for a bit of an inflection, maybe not the "bubble burst" that everyone is talking about, but things will change. The last one is a big one. Though I studied CS in college, I hadn't actually coded anything real in a very long time. But once I started, I couldn't stop. I was able to get back to the feeling I had been missing so much the last couple years. Passion! After all of that, I decided to leave SF for a bit to work on the app full time. Around the same time, I stumbled upon a blog post about The User Is Drunk, in which Hacker Paradise was mentioned. Everything came together at that moment. And now I'm in Porto with a group of lovely people doing lovely things. Stay tuned for my musings and updates here.